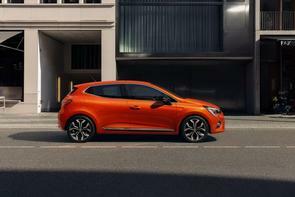 Renault has revealed its all-new Clio. As you can see, this is a very evolutionary piece of design, as the car looks broadly the same shape and style as the old Mk4. Don't be fooled by the similarity, though, as Renault claims the Mk5 has '100 per cent new parts.' It's actually also 14mm shorter than the Mk4, although its manufacturer says the all-new Clio has more room inside - plus, it's 30mm lower for greater aerodynamic efficiency. Perhaps the most noticeable alteration to the Clio's face is the adoption of the C-segment daytime running light signatures, as seen on the larger Megane hatchback. All models, from entry level upwards, gain fully LED headlamps, which are complemented at the rear by clusters that also feature a C-shaped motif. Ten body colours, including the new shades of Valencia Orange and Celadon Blue, enhance the curvy bodywork, while there will be three exterior customisation packs (in red, orange and black) for further personalisation options. Along the sides, the flush, high-mounted rear door handles are a carry-over feature, while air deflectors are fitted to the front wheel arches. Wheel sizes will go up to 17 inches for now, while we await the development of a new Renault Sport version. Speaking of which, the sporty-looking trim line beneath the full RS will now be known as RS-Line, rather than GT-Line as previously, and will feature all the usual visual accoutrements of one of these flagship-copying specifications. Finally, Renault says the Clio's boot capacity has increased a whopping 91 litres to a peak of 391 litres with all seats in use, while there's another 26 litres of interior storage space on offer. Most of this cargo generosity is because the Clio's premium Bose audio system has been fully integrated and therefore does not encroach on the boot's volume. A double-floor loading system will be incorporated in the Renault and the rear seats fold completely flat, although the company does not at this stage reveal how big the cargo area is with the back bench stowed away.